The Rebel Sweetheart. 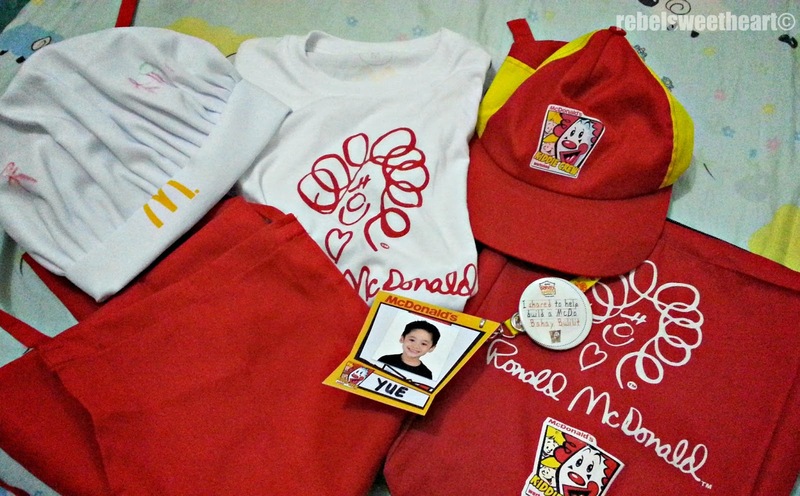 : The McDonald's Kiddie Crew Workshop + Giveaway! 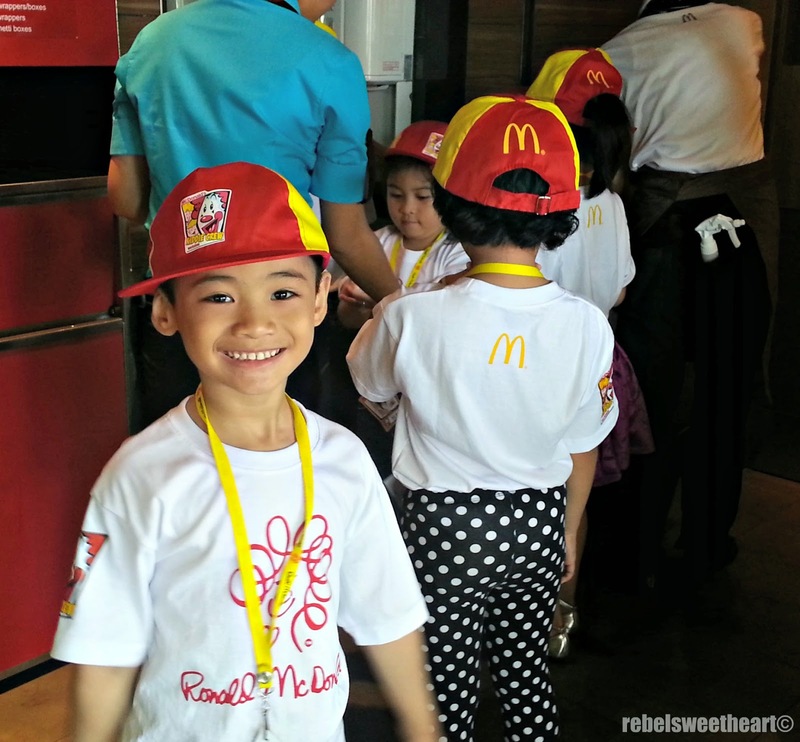 After the Holy Week, my little man embarked on another summer activity - the McDonald's Kiddie Crew Workshop. 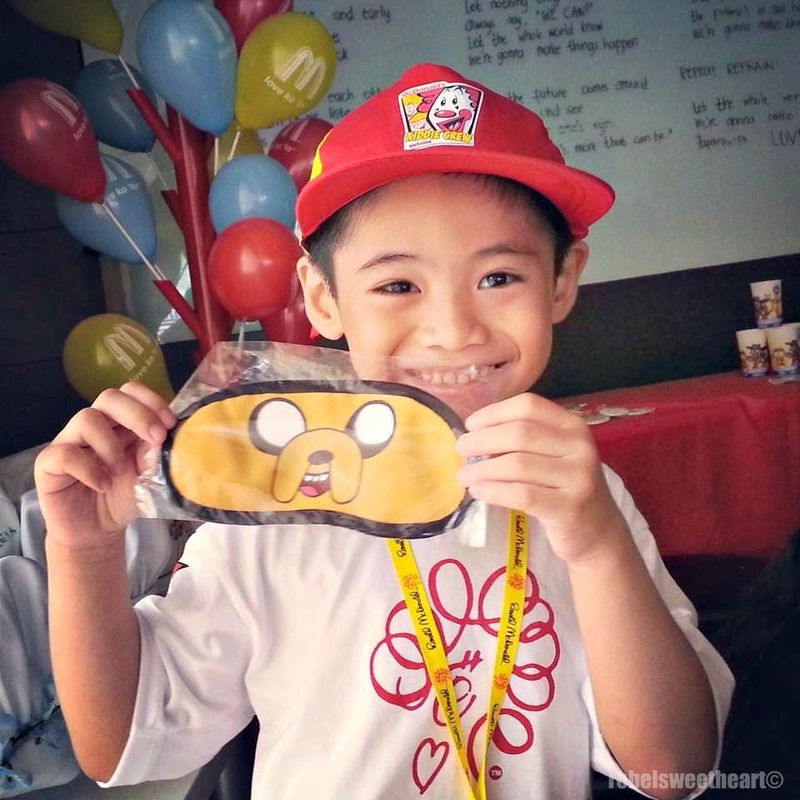 He took part in this workshop last year, and he even won gift certificates (plus bragging rights, lol) for being the 'Cutest Kiddie Crew of the Week'. 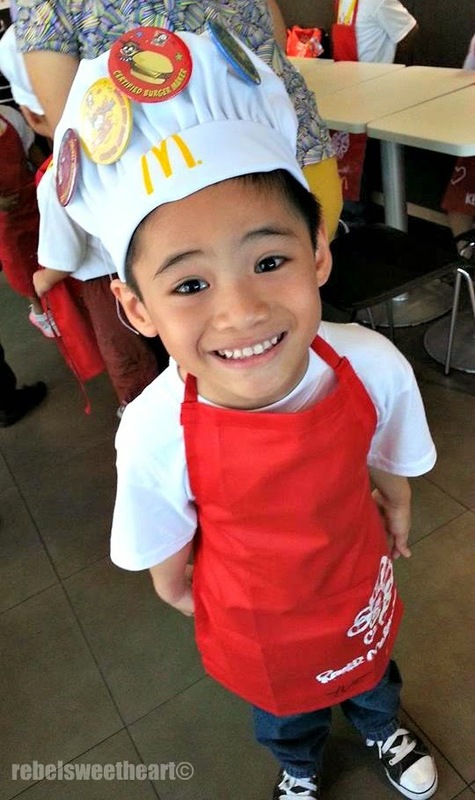 But because the little man wanted to become a 'Kiddie Crew' again and seeing how much he enjoyed the experience last year, I decided - on a whim - to sign him up for the workshop again. Kiddie Crew year 2 for my little man! 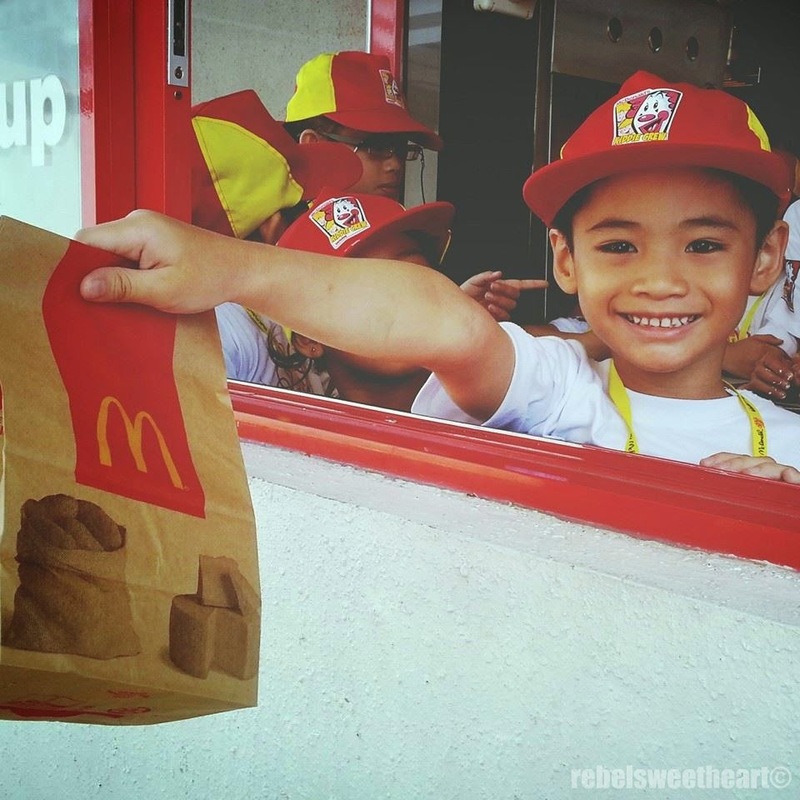 And so on the morning of April 21st, the little man and I trooped to McDonald's Rizal Avenue, together with his other crew mates (and their parents) for Batch 4 of the Kiddie Crew Workshop. As I've mentioned before, this workshop is done in batches, with each batch going on-board for five days, 2 hours per day. 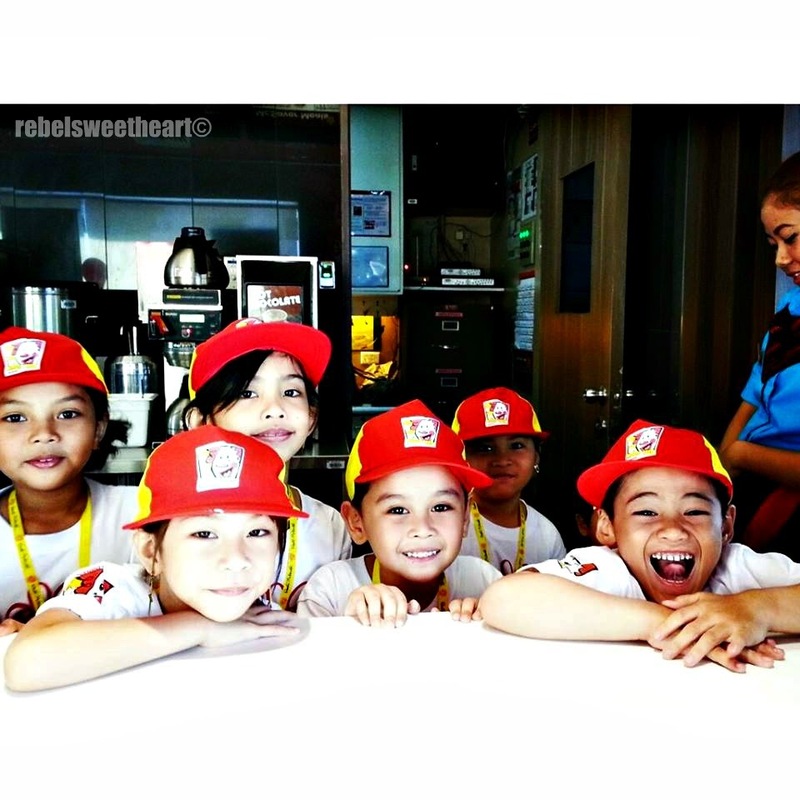 Registration fee costs Php 595, which includes the Kiddie Crew uniform (shirt, bag, cap, chef's hat, apron, ID with lace), workshop materials, plus meals for the kids. Clockwise from L-R: Chef's hat, shirt, cap, bag, ID with lace, apron. 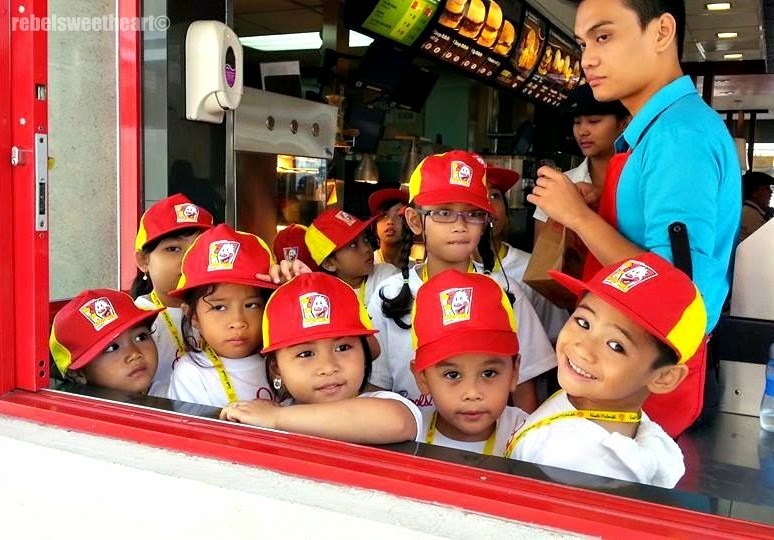 Now I bet you didn't know that McDonald's has been hosting this summer program for 21 years now. 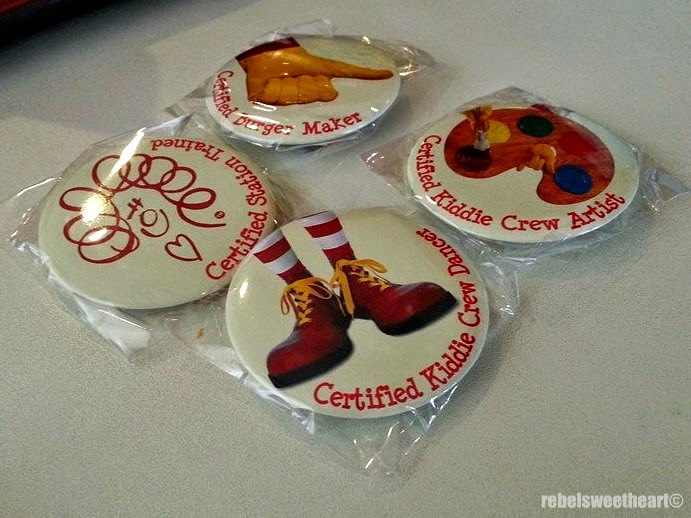 Yes, the first Kiddie Crew Workshop was actually held way back in 1991! 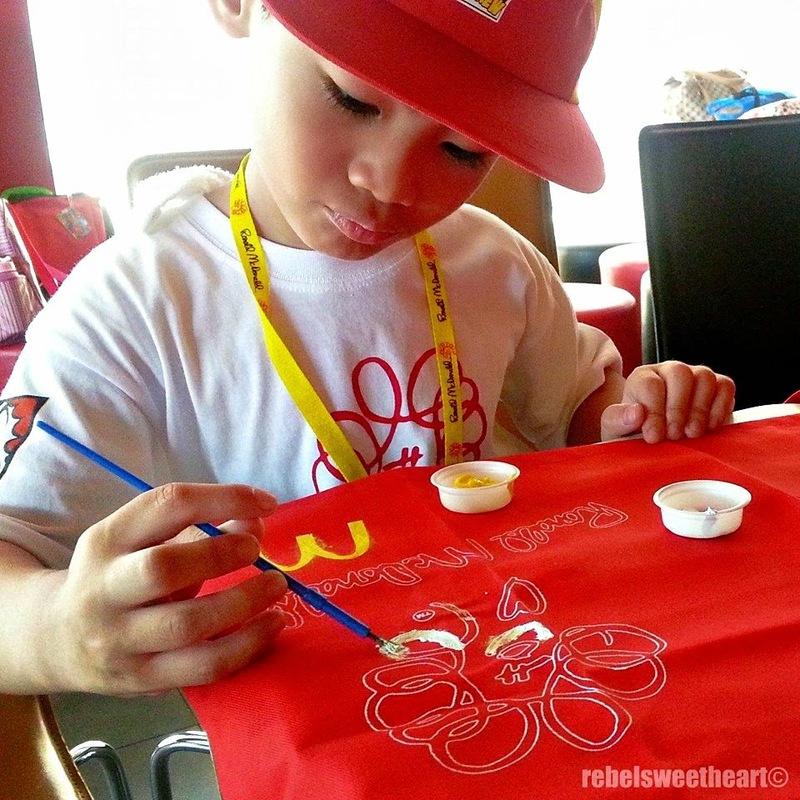 Like last year, the Kiddie Crew members did fun activities like singing, dancing, and painting. Dancing to the tune of 'Do the Ronald'. Singing their theme song 'Make it Happen'. 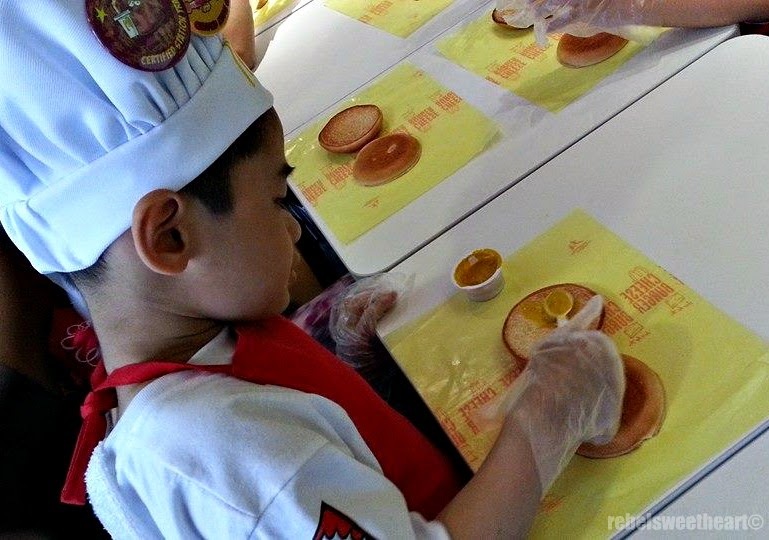 And with the addition of the chef's hat in this year's kit, the kids were given the chance to jazz up their hats and decorate them the way they want! Putting stickers on his chef's hat. 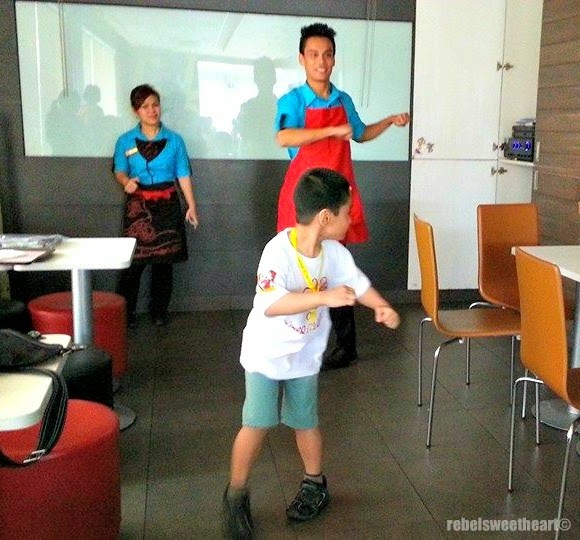 The Kiddie Crew members also went 'on-floor', where they got to mingle with the crew and assist them by doing simple tasks such as greeting the customers, putting ice on the glasses, placing trays on the counter, and my son's favorite job - handing out drive-thru orders. Oh, and the kids made their own cheeseburger, too. Showing off the finished product. Now this workshop was not just fun and games. 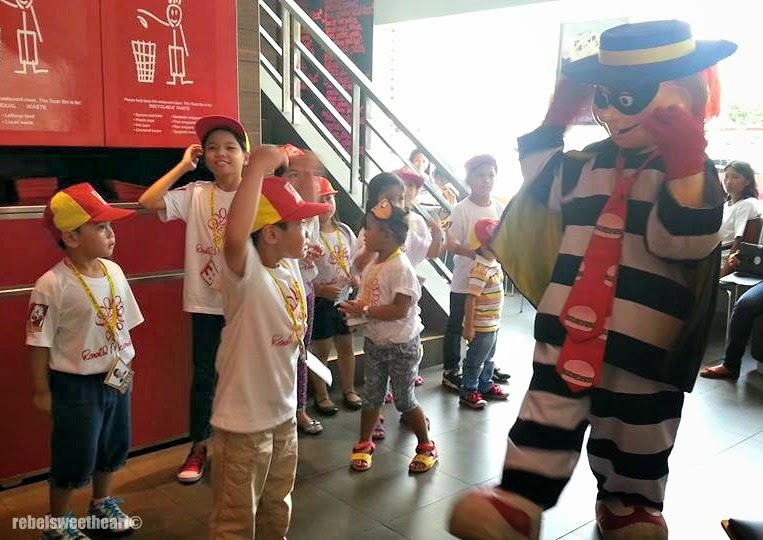 These activities actually taught the kids the importance of hard work, discipline, teamwork, and the joy of sharing. 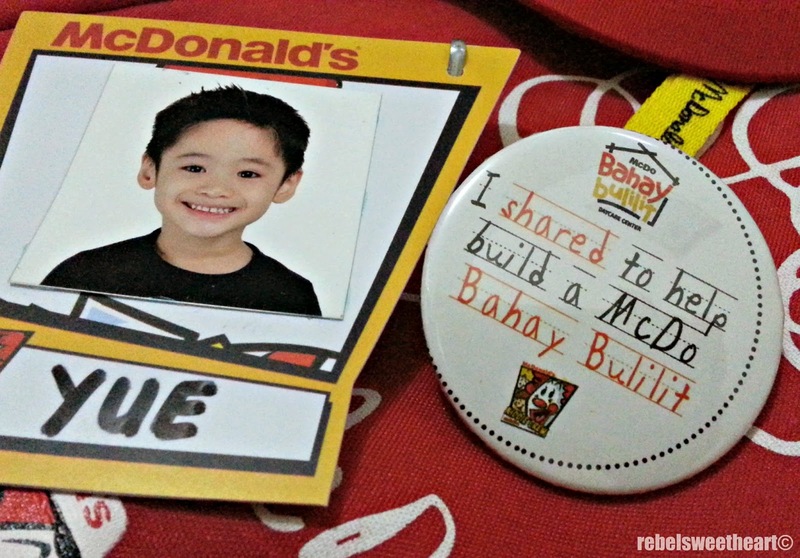 For any amount donated to the Bahay Bulilit program, kids will receive a badge like the one Yue has. On the fifth and final day of the workshop, a simple graduation ceremony was held. 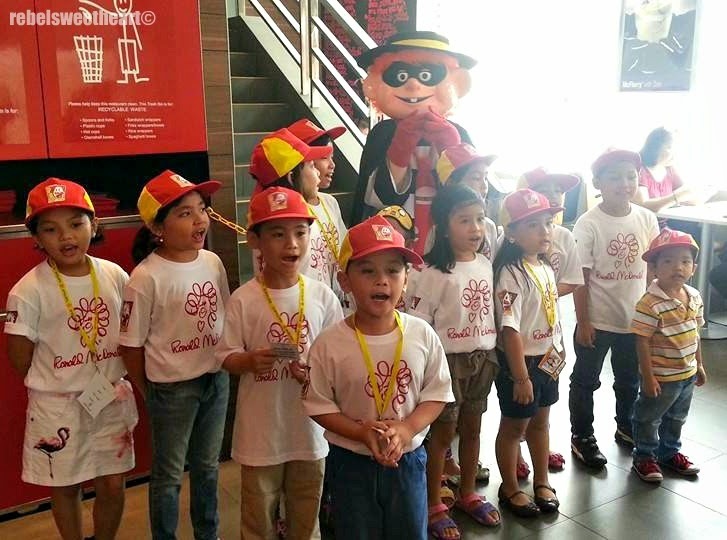 The participants received their Kiddie Crew badges, had a meet and greet session with Hamburglar, and even had the chance to showcase their talents by performing in front of the customers! 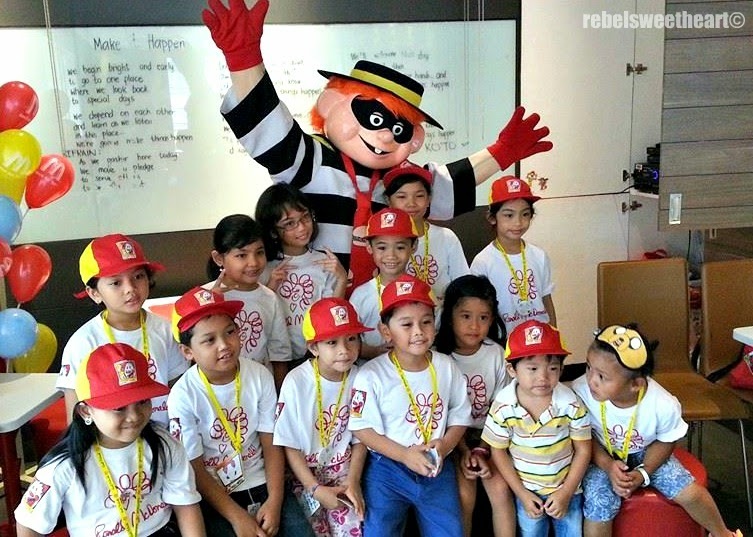 The kids danced 'Do the Ronald' together with Hamburglar, and sang the Kiddie Crew theme song, 'Make it Happen'. The kids played some fun games too, and they all got to bring home some really cool prizes. Loving the prize he got! The little man and his crew mates will all meet again on the 31st for the Grand Graduation Day. 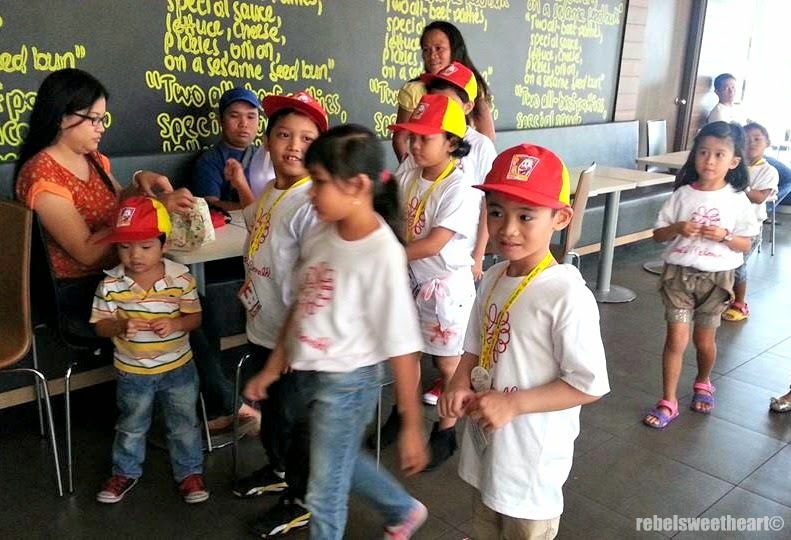 Together with the other Kiddie Crew graduates of the McDonald's Rizal Avenue branch, they will all receive their Kiddie Crew certificates, and convene for an afternoon of fun and games for the whole family. Now here's the best part. 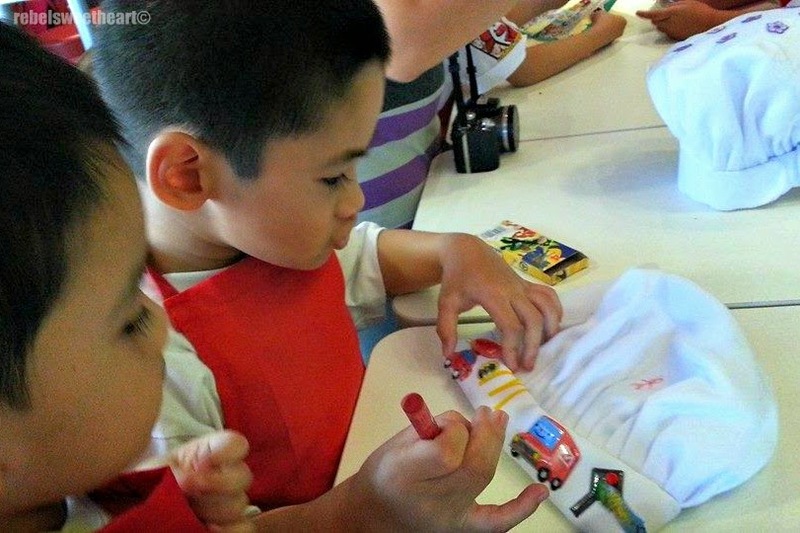 I'm giving away four Kiddie Crew kits to four lucky readers, and the chance for their kids (or nieces, nephews, and siblings) to experience the Kiddie Crew workshop as well. To join the giveaway, simply accomplish the basic tasks indicated on the Rafflecopter below and on the comment section below, answer the question, 'What is your favorite childhood summer experience?' together with your name, email address, and the links to your social media shares. This giveaway will run from May 5 to May 10, open to NCR residents only. Winners will be announced on May 14, and will be notified via email. 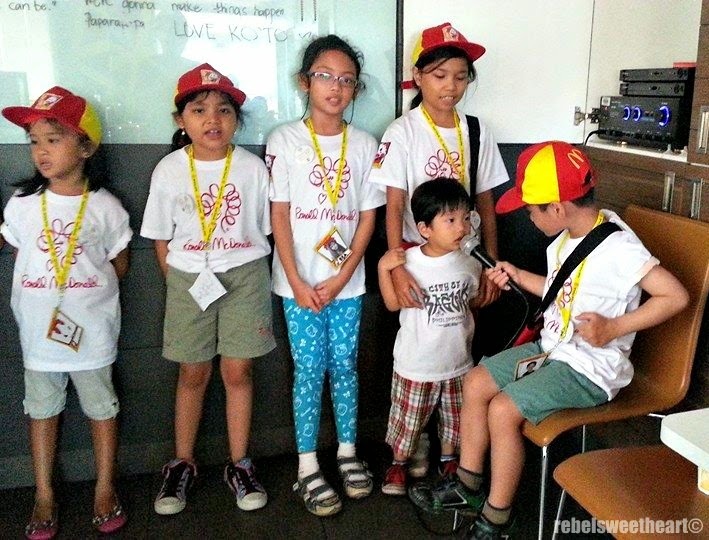 Winners are to take part in the Kiddie Crew Workshop on May 19-23 in their preferred store. My favorite summer childhood experience would be going to the aquarium or zoo. I know my girls would both love going. Didn't realize this was NCR residents only. I apologize. My entries would be invalid as I am from the US. My most favorite childhood experience is honestly, egg hunting. I know we are past the Holy week but I was really looking forward to an egg hunt but unfortunately, there is none for adults. It made me realize that it is one of my favorite childhood experience and i missed it. summer childhood moments to treasure! your young man is dashing!!! What a cutie! He looks like he had such a great time. My favorite summer childhood experience as far as I could remember is going to my grandfather and grandmother's house, where I will stay there for the whole month, being their favorite "APO" I am able to do what I wanted. I can get without any fear that my mother would scold me. My Lola even let me help me cook and I am able to hold spatula. I really feel so free with them. I love my LOLO and LOLA so much and I am missing them so much. I don't think they do this in the US-of course I could be wrong. At least the kids appear to be having fun! My favorite chilhood experience was skipping classes to go shopping with my mom. Hahaha! WOW looks like a really fun "camp" I don't know if they have that in the US but I know my kids would LOVE IT!!! wow! This looks like a lot of fun for kids! My summer childhood experience is to summer outing with my relatives..
What is your favorite summer childhood experience? I remember that every summer we see to it to visit my grandma in ILOCOS. We always stay there for a week and make sure that my family will have fun. 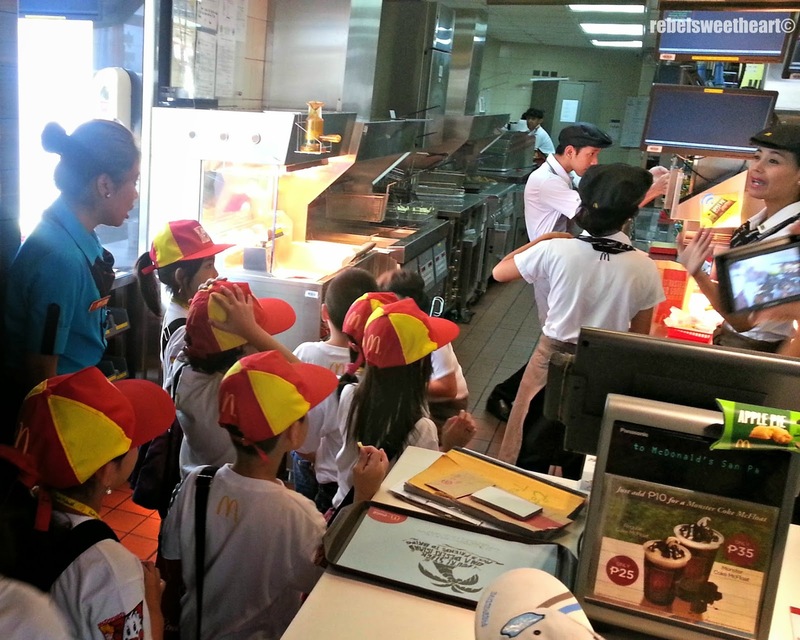 WHen my daughter was in kindergarten they got a behind the scenes tour of McDs. Kids thought it was neat. One of the best childhood memories I had was when I performed in a ballet recital when I was just 6 years old. It was fun and unforgettable! 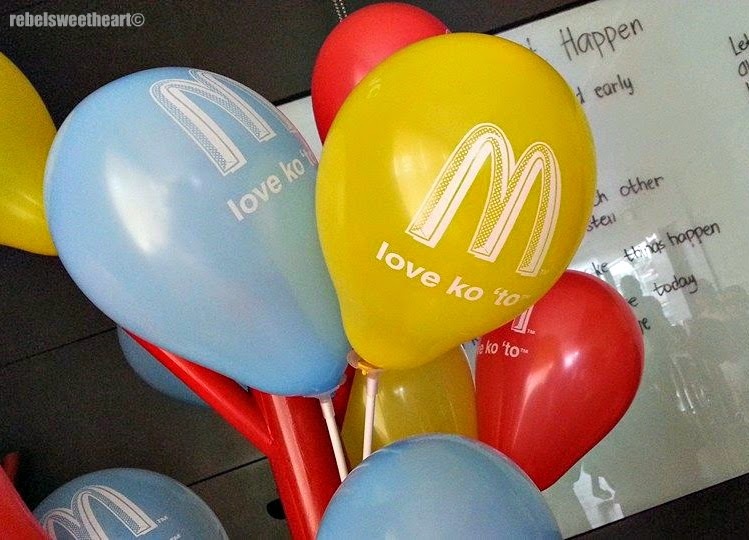 This is super nice glad Mcdo does this every year. Teach kids responsibility among everything else. I had the best summer experience when we visited our mom's hometown,a very remote province but full of fun activities we got their. My Lolo prepared three days before we arrive his "bangon" that's what they called it a bamboo made cage for shrimps and crablets,we had our lunch beside the river, of course from his freshly harvest shrimps,crablets and some st.peter's fish which my mom grilled and can't forget the freshly picked ripe mangoes and bananas for dessert, yummy. How I wish I can gave such simple but unforgettable experience to my children and grandchildren, minus their gadgets of course. Best childhood memories when I attended DVBS Daily Vacation Bible School they fetch us like a school bus they teach how us diffirent verses from the bible everyday we sing and dance there and do craft and met new friends. My fave summer childhood experience is going to beach with my family. Bible studying and swimming in the river with my brothers and little sister! My favorite summer childhood experience is when i get excited to jump on the pool without knowing that the pool is in 7 feet deep. my fave summer memories was going to the places my dad was assigned to. (he was an army back then) it was fun going to different cities and remote places coz me and my bro learned a lot from it. I don't ever eat at McDonald's. I never have and neither have my children, but I just have to say that your son is completely adorable! My Childhood memories is more on playing outside, playing on the street thats why when im so dark due to too much sun exposure. But i enjoy my childhood i played lots of street games like patintero, taguan, shato(tama ba spelling) and agawan base. Im so boyish that time. What is your favorite summer childhood experience? Spending summer with my childhood friends playing patintero, tumbang preso, Chinese garter, luksong baka, luksong tinik, sipa, etc. My favorite summer childhood experience is when me and father go malling together! My favorite summer childhood experience was i spend it at my Mom's province in Catarman Northern Samar. Aside from the beach and bonding with my cousins and childhood friends, i got the chance to serve as a tindera at my Aunt's sari-sari store. Truly a summer to remember! My favorite summer childhood experience is watching Chinese Opera. There is a Chinese Temple near our house and every May, there would hire a performing troop during the "feast day". It was very entertaining to watch the artist in ancient costumes with intricate headpieces singing to the accompaniment of drums, flutes, cymbals and other musical instruments. Hi Remz! You have to follow the mechanics in order to join the contest. Thank you. My favorite childhood experience is playing patentero, chinese garter and luksong tinik with my friends. I'm waiting for my youngest to be the right age. This looks so much and he looks like he had a memorable experience. My eldest did this last year, and she enjoyed doing it! 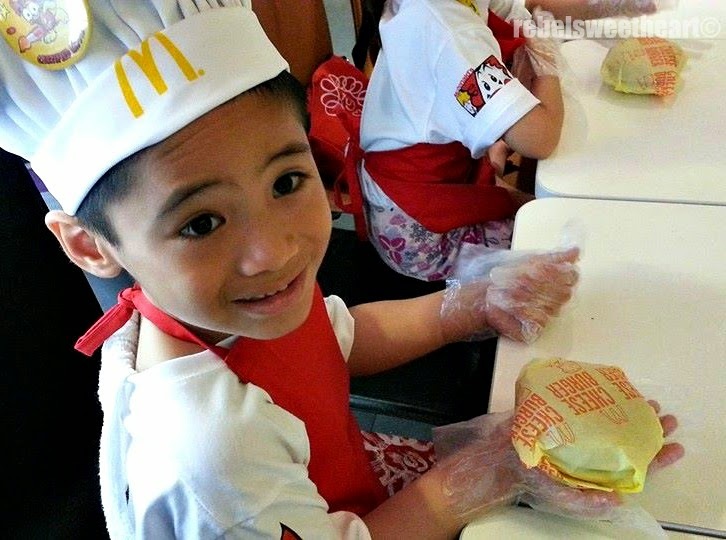 Cute ng anak mo, at ang smile... it just shows that he loved what he was doing! The activity is so cool for children, everybody was happy.